So many times, I hear people say they would never schedule a session because their dog won’t hold still. Or, their dog can’t be off leash and they wouldn’t want to see the leash in the photos. Well let me tell you a little secret – most dogs aren’t off leash for their photo sessions. That’s right! While I do sometimes have a dog off-leash, there are many reasons why I’ll use a leash during a photo session. The number one reason for a leash is safety. 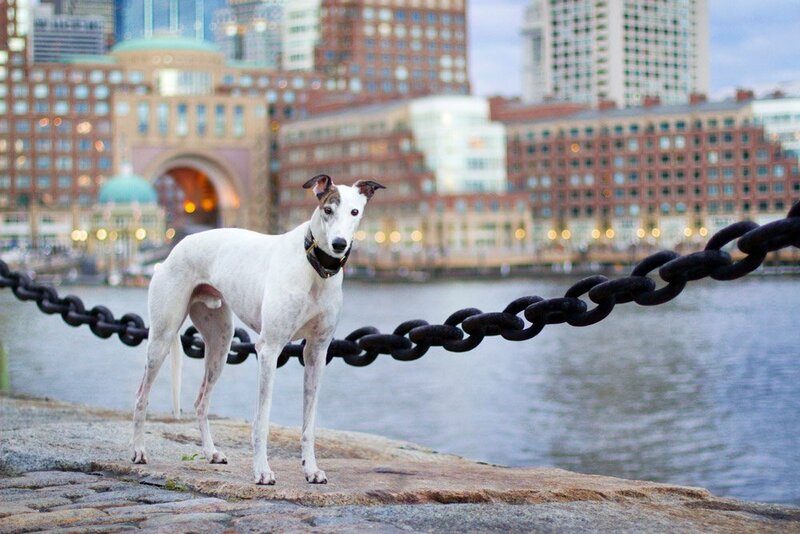 Dodger was newly adopted when we traveled into Boston for his photo session. With all of the city’s distractions such as cars, people, bikes, and pigeons, plus the fact that there was no way we would ever catch this speedy sighthound, it was just not safe to remove his leash. Also, Dodger needed a little extra support from his person to be relaxed and happy, so she stayed right by him for his photos (a few extra cookies helped too). Keeping the session fun and safe for the dogs is always the most important thing, even if that means a little extra editing to create the perfect photo. For photos like Dodger’s with a complicated background, I took two shots – one with Dodger and his person and one with the view of Boston Harbor. Having the second photo made it much easier to remove Dodger’s person and leash from the first photo. What do you think of the final result? Would you be interested in seeing more “Behind the Scenes” photos? I loved the behind the scenes insight! Great job removing the leash and human, and for debunking that myth! This is great! I would definitely like to see more… thank you for sharing!